iPhones are loaded with Safari browser which is considered as one of the most secure web browsers. It is comparatively smoother and faster. So, if you love to browse websites on your iPhone or iPad then a small tip in this article will help you keep your browsing experience private and smooth. We often use our web browsing history to find out what exactly we searched for in the past over the Internet. But sometimes we want to delete this record from our device. In some of the articles you will find a method to clear your browsing history and website data, but here is a method to clear data for specific websites from the browsing history which helps you keep browsing history safe. First of all, you need to navigate to the settings of your iPhone from the home screen. Here you will find settings for the Safari browser. 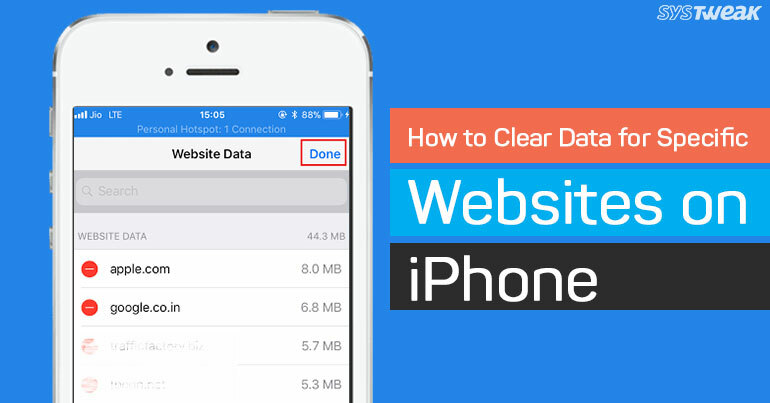 You will see an option to clear history and website data which is to clear all the website data and history, but we want to clear specific website from the history so you should not tap on it. Tap on “Advanced” given at the bottom and then Data. In the full list of websites, you will find all the websites you have opened on the safari browser. Now tap on Edit button to exclude websites from the history. You will see “-“symbol in from of all the websites tap on it for the websites which you want to exclude from the history. Once you are done removing the websites tap on “Done” given at the top right corner. That’s it! Now you can go to Safari browser and try typing the name of the website you have just removed from the history. It will not show you the website in the drop-down list. This is how you can keep your browsing history safe and can remove unwanted websites at the same time.